Siddaleah's Tarot Journal: Heaven Via Chariot? My uncle is losing his battle with leukemia. He's not expected to live past Christmas, if he makes it that long. I keep hoping for some miracle to come and save him, but maybe a peaceful passing is what I should be praying for. I did a spread asking what the next few weeks would look like for him. Probably because of wishful thinking my first read on these cards was that The Chariot represents my uncle's desire to fight this cancer. He wants to undergo an aggressive treatment to try and beat the cancer, but his doctor believes the treatment will kill him even faster than the cancer. His heart is simply not strong enough to survive a stronger dose of chemo. When I saw these cards I thought maybe they were saying he would fight and be victorious. 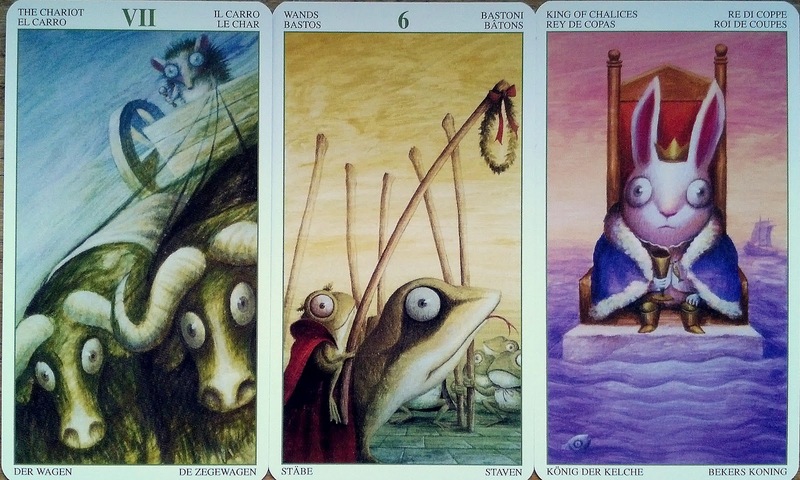 Surely the Six of Wands shows a man surrounded by love and support celebrating a victory, right? But after thinking about it more, and knowing that my uncle is home under hospice care, preparing to celebrate Christmas early so he can see the joy in his grand-children's faces one last time, I think maybe The Chariot indicates that he will be leaving this world for the next very soon. The next two cards seem almost heavenly in that context. If this reading does indicate that he will by dying soon, it shows joy and love await him in the next world. I really want to believe that when we die we are reunited with loved ones. The Six of Wands paints that picture too. Maybe the King of Cups is God, in this case. God is love, after all. No matter how confused I am about all things divine at times, that is the one belief I cling to the most. As if that isn't clear enough, when I add up the cards to calculate the quint card I get 7+6=13. Death. Either way, I want to believe what this reading is telling me. I hope a miracle happens and somehow his heart is strengthened and he can live to fight. The truth is, though, that we are all going to die, and no matter how hard I try to forget that truth, sometimes it gets right up in my face and demands to be acknowledged. This is one of those times, so if I have to face it, I want so badly to believe death is a passing from this world to a better one filled with love and joy. That does seem to be the message for me today. If only I could believe it. Very, very sad to hear of your uncle's cancer. I really hope he can beat it, and that he is able to enjoy time with family and friends either way. Thank you, MM. He celebrated Christmas tonight with his wife, kids, and grandkids. I live out of state, so could only be there in spirit, but I'm glad they all had one last celebration together. Oh, that's really hard, Siddaleah! I feel for you, and send you loving energy and (((hugs))) I definitely believe that the Universe is loving, it's what binds everything together. Hope you can find that comfort.